Our “do-it-for-you” marketing platform is built for local businesses. We schedule a professional photo shoot to capture your space, products or services, and people to best represent you on each of your social platforms. We create or upgrade all your social media pages. We track data on every platform we manage for you, and we share it with you so you can hold us accountable. Your customers are always online, and so are we, with 24/7 monitoring for new reviews, and unlimited responses. 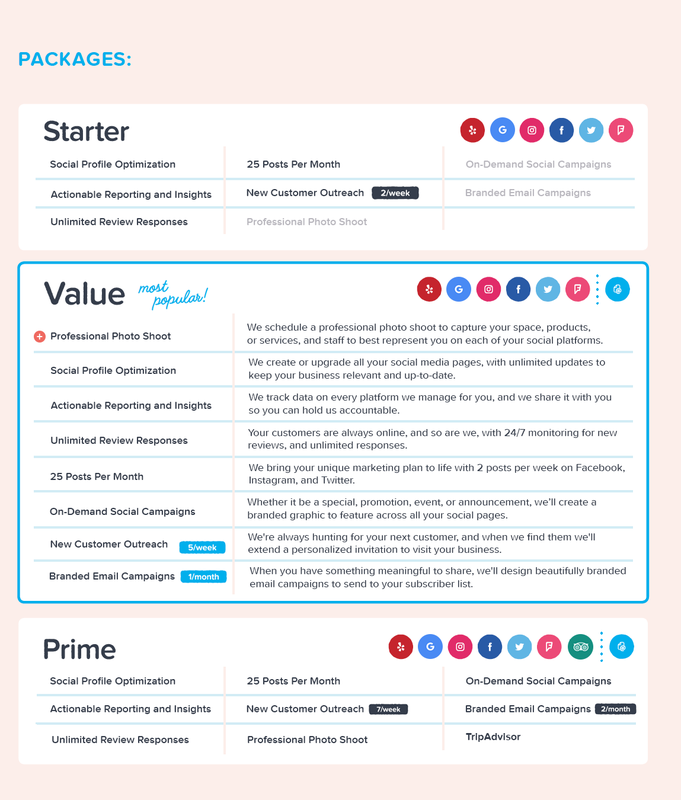 We bring your unique marketing plan to life with 2 posts per week on Facebook, Instagram, and Twitter. On-Demand Social Campaigns – Whether it be a special promotion, event, or announcement, we’ll create a branded graphic to feature across all your social pages. We’re always hunting for your next customer, and when we find them we’ll extend a personalized invitation to visit your business. When you have something meaningful to share, we’ll design beautifully branded email campaigns to send to your subscriber list. We make it easy. We do all the work, so you can focus on satisfying your customers. We make you look your best on the websites where customers spend time. We build attractive and effective virtual storefronts for your business. We help you get found, bringing more people to your business. We monitor what people are saying about you around the clock. We track customer reviews, Facebook messages, Tweets, and more. We do all the work of keeping track of your online reputation. We respond quickly to all customer reviews and messages, while they’re fresh. We thank people for positive reviews and respond thoughtfully to negative ones. We help positive reviewers evangelize for your business around the web. With social media, word of mouth has moved online. We make it work for you. We engage your fans with tips, recommendations, and other helpful info to share. We manage promotions that reward your fans for spreading the word to friends. We continually track our clients’ online performance. Reviews, stars, fans, followers—we report it all in one convenient place. A single snapshot of your social media presence.